Picus tridactylus Linnaeus, 1758, Sweden. Although North American and Eurasian populations appear similar, recent studies suggest significant genetic differences. Three races are recognized in the New World, five in Eurasia. 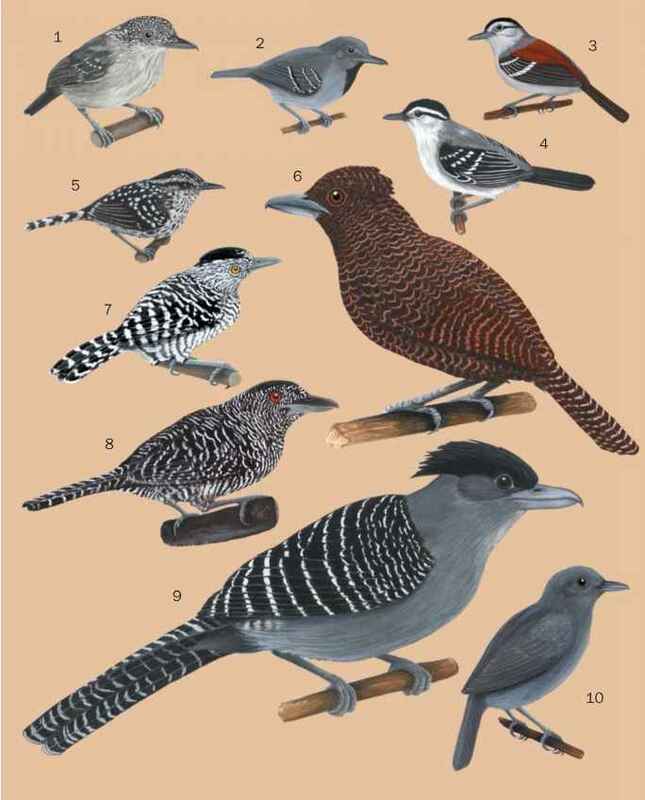 English: Northern three-toed woodpecker; French: Pic tri-dactyl; German: Dreizehenspecht; Spanish: Pico Tridáctilo. 8-9.5 in (20-24 cm); 1.6-2.7 oz (46-76 g) a medium-sized woodpecker with black above, white below, varying extent of barring on flanks and white on back; male has a yellow forehead and crown, female has a whitish crown with fine black streaks; immature has duller plumage that is somewhat brown; only three toes on each foot. 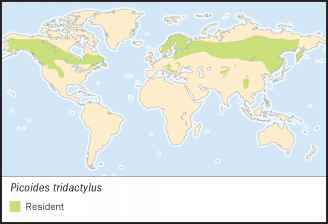 Resident from near the tree line in northern Alaska, northern Canada, northern Eurasia, south to northern tier of United States, mountains of southern Europe, western China, northern Mongolia, northern Korea, and Japan. Wanders south in winter to New England, north central United States. P. t. tridactylus, northern Eurasia, Scandinavia, Latvia, to Mongolia, southeastern Siberia, and Sakhalin Island; P. t. crissoleucus, northern taiga from Urals to Sea of Okhotsk; P. t. albidor, Kamchatka; P. t. alpinus, mountains of central, southern, and southeastern Europe, northeastern Korea, Hokkaido, Japan; P. t. funebris, southwestern China to Tibet; P. t. dorsalis, Rocky Mountains, Montana to Arizona and New Mexico; P. t. fascia-tus, western North America, Alaska, and Yukon south to Oregon; P. t. bacatus, eastern North America, Alberta east to Labrador and Newfoundland, south to Minnesota and New York. Coniferous forest; less often mixed coniferous-deciduous forest. Nonmigratory, often very quiet; very arboreal; populations respond to forest insect outbreaks. Feeds primarily on wood-boring insects, their larvae and pupae; forages lower in winter than at other times; when sexes forage together, females forage higher than males. Monogamous; breeding activities generally extend from mid-March through June; nest cavities usually excavated in dead stub; pair share excavation, incubation, and care of young; clutch size 3-6 eggs; incubation period 11-14 days; young fledge at 22-26 days.